Bring Civil Rights, Revolutionary and Industrial history to life in these American cities. Field trips are essential to any curriculum because of their unique ability to inspire students’ interest in the class material and to provide a sense of relatability that you simply can’t find in a textbook. Students will return from these eight destinations with a greater appreciation for both their course of study and the course of history. Often referred to as the “Cradle of Liberty” due to its role in instigating the American Revolution, Boston is a city jam-packed with fascinating history and rich culture. 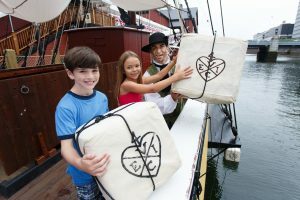 Book a tour aboard the Boston Tea Party Ships and Museum for a living history presentation that will ignite students’ imaginations. Samuel Adams and the Sons of Liberty will guide your student group through a reenactment of the Boston Tea Party town meeting and give them the opportunity to destroy British tea at Griffin’s Wharf as the revolutionaries once did. For groups looking to gain more insight into the American Revolution, take a walking tour on the Freedom Trail, a three-mile trail that traces the events leading up to the War of Independence. Students can stroll through the Old South Meeting House – the site of the Boston Massacre – the Paul Revere House and the Bunker Hill Monument before eating lunch in the Boston Common, the oldest park in the nation. Begin your exploration of Boston with a visit to Plimoth Plantation, a recreation of a 17th-century English village where the first Pilgrims would have lived. Role players will act as citizens of the Plymouth colony and educate students through storytelling and tours. Expand students’ knowledge of the anti-slavery movement in Boston by touring the Black Heritage Trail and walking through the Museum of African-American History. Boston was the first state in the U.S. to record no slaves and is home to the African Meeting House on Beacon Hill, where many major abolitionist speeches were given. Student groups in the city should explore the historical buildings in Copley Square. Be sure to have students visit the renowned Old South Church, Trinity Church and New England’s tallest building, the John Hancock Tower. Later, while trekking through the Boston Public Garden, America’s first public botanical garden, take notice of the majestic George Washington’s Statue. The statutes of Paul Revere, Sam Adams and John Singleton Copley are also worth seeing while in the area. 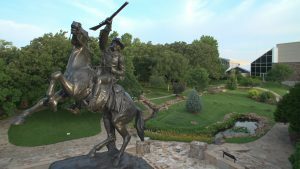 Take your students on a Wild West adventure to Oklahoma City—a city that has recently experienced an increase in growth in the group travel market. From Bricktown to the Oklahoma River, this city is filled with alluring and historical landmarks ideal for any group of students. Students will also rave about the National Cowboy and Western Heritage Museum, which tells the fascinating story of the Wild West and rich Native American culture in Oklahoma. The Science Museum Oklahoma also features skeletons, organs and models of the human body as well as exhibits about insects, space and aviation. The Oklahoma Railway Museum is a unique museum where students can tour real vintage train cars and steam engine locomotives. For groups interested in the humanities, the Oklahoma City Museum of Art boasts a large collection of photography, paintings and ceramics. To discover the history of the state itself and its most famous residents, check out the Oklahoma Hall of Fame in the Gaylord-Pickens Museum, which offers a free field trip program. Stop by the Red Earth Art Center to teach students about Oklahoma’s past as Indian Territory. Here, with its Center for the American Indian, the museum dedicates itself to preserving the rich artwork and culture of American Indians through education, festivals and markets. In fact, the center hosts markets for local Native Americans to sell their art to the public. Spend the afternoon at the Martin Park Nature Center, a 140-acre natural wildlife refuge. Hike through the park’s nearly three miles of woodland trails or learn through the hands-on museum. Student tours can enjoy Oklahoma’s landscape and explore the visitor center’s nature learning library and display of live animals. After a relaxing picnic at Martin Park, stop at the Historic Harn Homestead Museum. This 10-acre scenic outdoor complex, claimed during the Great Land Run of 1889, will teach students about life in Oklahoma during the territorial times. Capture the courageous character of the men and women who settled in Oklahoma through a self-guided tour through the seven buildings, including a one-room schoolhouse and 1904 Victorian home. Often called the “Gateway to the West,” St. Louis is best-known for its role in the Louisiana Purchase, the impetus for westward expansion in the U.S and the birthplace of the ice cream cone. The iconic silver arch acts both as a tribute to famous explorers Lewis and Clark and as a gateway into this lively city on the edge of Missouri. The Griot Museum of Black History and the National Blues Museum can offer insight into the African-American experience in St. Louis throughout history, as well as the Old Courthouse – site of the famous Dred Scott trials. Students of all ages will have a blast at the City Museum, an interactive museum of St. Louis history that doubles as an indoor and outdoor playground. The Magic House Children’s Museum is a must-see for younger student groups, as is the planetarium at the St. Louis Science Center. For groups looking to learn about the city’s history, the Missouri History Museum enlightens and entertains visitors with exhibits that cover subjects like the African-American struggle for freedom in St. Louis, the 1904 World’s Fair and Missouri during World War I. 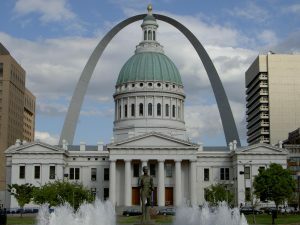 While in St. Louis, groups will also enjoy a trip to the Economy Museum at the Federal Reserve Bank, the Museum of Transportation and the various art museums such as the Contemporary Art Museum St. Louis and the 10th Street Gallery. Before you leave, students will undoubtedly want to ride to the top of the Arch to not only learn more about the impressive monument but to see the city of St. Louis from a brand-new perspective. A fun way to educate student on astronomy is the Delmar Loop Planet Walk, a scale model of the solar system that lets visitors take the three-billion-mile journey from the sun to Neptune in seconds. For a breath of fresh air, be sure to picnic in Forest Park, one of the largest urban parks in the U.S. and site of the 1904 Summer Olympics. Its nearly 1.400 acres includes the St. Louis Art Museum, the Turtle Park sculpture garden and the Muny (The Municipal Theatre Association of St. Louis). Students learning about the Civil Rights Movement or Southern culture will benefit from the wide variety of museums and historic landmarks and the invigorating ways of life that constitute Birmingham. Educate your student group about the American Civil Rights Movement through the compelling exhibits at the Birmingham Civil Rights Institute. The BCRI includes displays that address the Jim Crow laws, Black Power in the Black Belt, women of the Civil Rights Movement and the bombings at the 16th Street Baptist Church. After learning about the atrocity at the BCRI, students can pay their respects at the actual Birmingham church where the tragic event unfolded. Student groups will appreciate a trip to the other diverse museums in Birmingham such as the Birmingham Museum of Art, the McWane Science Center and the Alabama Jazz Hall of Fame. Named after the statue on the top of Red Mountain that overlooks the city, the Vulcan Park and Museum includes exhibits that enlighten students about the city’s history and future. Programs are designed based on students’ ages, and there’s a personalized tour for every grade from lessons about family life in early Birmingham to curriculum about Birmingham during difficult times such as the Great Depression and the Civil Rights Era. Students should also stop at Arlington Antebellum Home and Gardens. Here, two guides will walk your group through the beautiful property, providing details about its rich history. Then, students should visit Kelly Ingram Park. 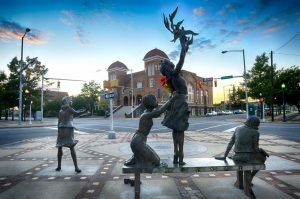 Situated next to 16th Street Baptist Church, this alluring, peaceful park was the heart of Civil Rights rallies and demonstrations in the 1960s. Students can participate in the park’s audio tour –a journey chronicling the historic significance pf each state and sculpture. Next, take students to roam the expensive property of Sloss Furnaces National Historic Landmark. This former pig iron-producing blast furnace is now a landmark interpretive museum and the first industrial sight to be preserved and restored in the U.S.
Detroit (also referred to as “D-Town” and “the Motor City”), the center of automobile manufacturing, Motown music and Coney Island hot dogs, is a Midwestern metropolis enriched with ethnic flair and a sense of rebirth and optimism. Learn all about the city’s history while on the Historical Perspectives Tour at the Detroit Historical Museum before hearing more about its culture at the Motown Historical Museum and the Charles H. Wright Museum of African American History, both of which welcome large groups. Continue your exploration of Detroit with a walking tour with the Detroit Experience Factory, a tourism company that will lead your student group around a Detroit area of your choice, whether through the downtown itself, the Eastern Market or the riverfront. The Michigan Science Center is also an enjoyable and academic destination for students of all ages – be sure to schedule your trip in accordance with one of its various live science shows. For a nature-based field trip experience, check out the Outdoor Adventure Center and the field trip programs at the Belle Isle Nature Center. 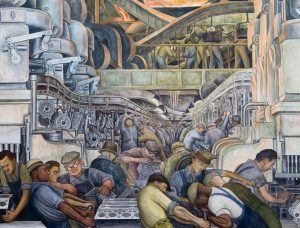 After an excursion to Detroit, your students will find it hard to believe that Detroit was a city in decline. An outdoor living history museum portion of the Henry Ford Complex, Greenfield Village is always a hit with students. Here, they can experience the sights, sounds and images of America’s past through the facility’s costumed interpreters. Highlights include riding in a real Ford Model T, exploring the laboratory where Thomas Edison invented the lightbulb and viewing reenactments of pre-industrial agricultural techniques. Be sure to spend an afternoon at Campus Martius Park, a city-wide and regional gathering place. A two-square block in the middle of downtown Detroit, the park is a great place for students to enjoy Detroit’s famous skyline, relax at the Woodward Fountain and reflect in the charming gardens. Washington, D.C. lends itself to student travel due to its abundance of tour programs and impressive number of landmarks and attractions. Most must-see sites are on the National Mall, a national park that spans from the Lincoln Memorial to the United States Capitol building. 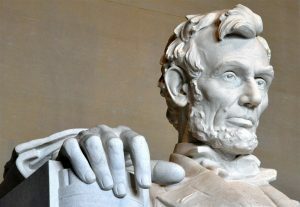 Request a staff-led tour at the U.S. Capitol to learn all about congressional meetings and procedures and allow time for your students to gape at the immensity of the marble immortalization of President Lincoln at the Lincoln Memorial. Also on the National Mall are Smithsonian museums such as the National Museum of American History and the National Air and Space Museum. Encourage students to apply their knowledge of American politics while touring major government buildings such as the White House, Supreme Court building and Library of Congress. Expose students to more serious events and themes such as attending the solemn Changing of the Guard ceremony at Arlington National Cemetery and paying respects at the Vietnam Veterans Memorial and United States Holocaust Memorial Museum. Another popular site to visit is the National Archives Museum, displaying well-known documents such as the Bill of Rights and the Declaration of Independence. Students visiting the museum will also see the original copies of the Magna Carta from 1297 and Lincoln’s Emancipation Proclamation. The Tidal Basin, a man-made reservoir between the Potomac River and Washington Channel, is a site conjoining the Jefferson Memorial, Martin Luther King Jr. National Memorial, Franklin Delano Roosevelt Memorial and George Mason Memorial. The National Portrait Gallery is a historic art museum that hosts tours, artist talks and family programs dedicated to exploring the lives of historic figures such as presidents, artists, writers and activists. The gallery shares a building with the Smithsonian, another art museum that helps tell the story of how prominent historical figures have shaped the culture of our future. Atlanta, the site of the 1996 Olympics and a source of industrial innovation and social progress, offers visitors a chance to learn from the past while witnessing the future. 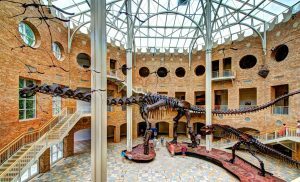 Add a little science to the field trip by stopping by the geological exhibits at the Fernbank Museum of Natural History. One of the most exemplary attractions in Atlanta, the museum encourages a greater appreciation of the planet and its people. Students will be both educated and entertained through the museum’s use of immersive programs, IMAX theater film screenings and extensive exhibits. A popular exhibit at a museum is the “Giants of the Mesozoic,” which includes some of the largest dinosaur skeletons in the world. Students will better understand the Civil Rights Movement and the Civil War after exploring the many museums that explain the period through guided tours and engaging exhibits. Plan a visit to the Martin Luther King Jr. National Historic Site to walk in his footsteps, visit the church where he voiced his dreams and pay homage to his final resting place. End your trip at the Center for Civil and Human Rights, which will not only teach students about the Civil Rights Movement in Atlanta but also about human rights issues around the world today. The Georgia Aquarium, one of the largest in the world, houses thousands of animals and provides high-quality tours to student groups. The World of Coca-Cola is a museum that highlights the history of the acclaimed beverage and its impacts on society. Another popular student group attraction is Stone Mountain. Students can hike up the mountain or take a high-speed cable skyride to the top. Be sure to stop by the park’s Historic Square, a collection and preservation of original buildings from around Georgia. Another student attraction in Stone Mountain is the Farmyard, where students can watch trained goats do tricks and feed and pet the goats themselves. From the iconic hoagies (sub sandwiches) and the plentiful public art to the slew of historic locations and artifacts, Philadelphia will make a lasting impression on all student groups. 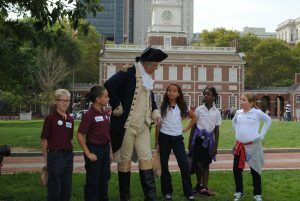 Students can visualize Revolutionary America after touring Independence National Historical Park. The park displays the cracked Liberty Bell and allows travel groups to walk through Independence Hall – the location where both the Declaration of Independence and the U.S. Constitution were signed. The park also includes exhibits such as Benjamin Franklin Museum, Congress Hall and the residence of first president George Washington. In addition, students can explore the former home of Betsy Ross, who stitched the first American flag. Quintessential stops for students visiting Philadelphia include museums such as the American Philosophical Museum, the National Museum of American Jewish History and the Museum of American Revolution—all of which allow immersive experiences with their exhibits, manuscripts and artifacts. Specifically, the Museum of American Revolution includes various galleries and original revolutionary war weapons in order to display the evolution of the colonies from their earliest days to the birth of the new nation. After learning about the early politics of America, students can check out the progression of the money creation process at the United States Mint. Tour groups can observe the coining method above the factory floor as well as the first coining press; they can even say hello to Peter— the resident bald eagle. The Independent Seaport Museum, located on Penn’s Landing on the Delaware River, is another attraction students will enjoy. This museum documents maritime history and culture, and the museum even includes two National Historic Landmark ships. After visiting the museum, students may enjoy free time on Penn’s Landing, a location with friendly attractions such as free festivals, concerts and movies. Next, students should tour City Hall, the largest municipal building in the country, and Carpenters’ Hall, which serves as the meeting place of the First Continental Congress. Both Philadelphia’s City Hall and Carpenter’s Hall are known as architectural treasures. After visiting these historic sites, students should explore the National Constitution Center. This center serves as the first-ever national museum that honors and explains the U.S. Constitution. Its 160,000 square feet are filled with high-tech exhibits, artifacts and a theatre that uses action to frame the importance of the Constitution to our nation and the world. For teachers, free downloadable lesson plans and worksheets make planning student travel to Washington D.C.’s Newseum an easy choice for integrating core educational standards into field trips.